In the early spring, the soil contains the greatest amount of moisture that needs to be preserved for growing plants. 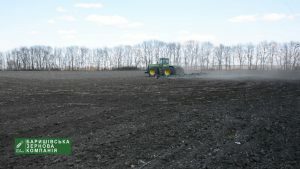 And the best way to do this is surface tillage – moisture is delayed both in the upper and lower layers. 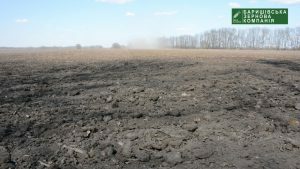 At present, 80% of the fields in the North Poltava Region of the Baryshivska Grain Company have retained soil moisture by harrowing. Corn, sunflower and soybean fields are being fertilized. A replenishment of winter crops was completed at the end of February. In addition, they are actively preparing for sowing time. –To start sowing campaign in the North Poltava region, we are 100% provided with mineral fertilizers and seedlings. All departments in the region are preparing machinery for entering the field for sowing. If the weather allows, we plan to start sowing sunflower seeds on April 8-9 , – said regional agronomist Yuriy Fesenko. To retain the soil moisture in the region, 10 units of imported machinery, including John Deere, are working in the fields. They are working in two shifts processing 1700-1800 hectares of land. Meanwhile, the process of retaining soil moisture in other regions is also coming to an end. –All structural subdivisions of the company are fully equipped with seeds, mineral fertilizers and plant protection products. 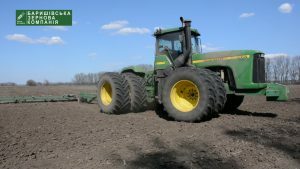 The sowing season in Baryshivska grain company will start on April 8, – says Oleg Koval, the chief agronomist of the company.